Ensuring the correct sequence across system boundaries and checking plausibility is an important task in every production plant. In addition, an automated distribution of the gained and logically processed information has to be realized in order to simplify recurring actions. This ensures a reproducible quality of the operational processes. Plausibility checks during production data acquisition are carried out in real time. Stored correlations, e.g. which material may be used for the current order or whether the tool used during setup has been released, are checked. This creates an interaction between the user and [LuQ2], which simultaneously ensures data acquisition and the correct processes during production. Process flow plans are used to ensure the correct sequence. These are developed project-specifically in cooperation with the customer and clearly describe existing customer processes. 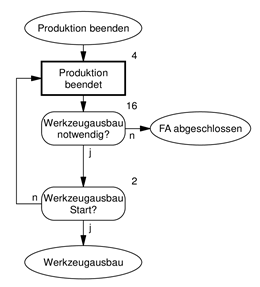 If the inputs deviate from the process flow plan, they are not accepted by [LuQ2] and the employee is notified accordingly. Thus incorrect bookings are avoided and a reliable data basis is created. The information gained from this can be transferred to different target systems. In this way, an automatic transfer of target values or recipe parameters to the control level, for example, is possible. The introduction of automated mechanisms supports the usual workflows across machines, levels or departments.